Being friendly is in dogs' nature and could be key to how they came to share our lives, say US scientists. "Our finding of genetic variation in both dogs and wolves provides a possible insight into animal personality, and may even suggest similar genes may have roles in other domestic species (maybe cats even)," said Dr Bridgett vonHoldt of Princeton University. 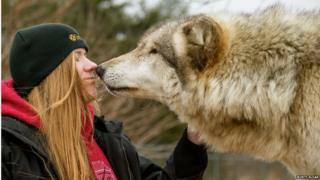 The researchers studied the behaviour of domestic dogs, and grey wolves living in captivity. They carried out a number of tests of the animals' skills at problem-solving and sociability. "This exciting observation highlights the utility of the dog as a genetic system informative for studies of human disease, as it shows how minor variants in critical genes in dogs result in major syndromic effects in humans," she said. "This could easily play into the story then of how these wolves leave descendants that are also 'friendlier' than others, setting the path for domestication," said Dr vonHoldt.